While writing down my goals for 2010 I realized there was a recurring theme, ‘Share Art’. Every goal was about sharing art in some way. It’s been the emerging theme from my journal pages, the voice of my muse. When your muse is speaking it’s wise to listen. I have several ‘Share Art’ projects in the works and hope to add several more venues in the near future. First on my list for today is ‘Hearts for Haiti’ an Etsy Shop opened to allow artists to share their work, all proceeds go to Haiti relief efforts, while artists donate work and pay for worldwide shipping. ‘Heart of Hearts’ is my donation. A 16×20 mixed media canvas. Pass the word around about this shop and let’s share art and raise money to help the horrible situation in Haiti. I’d also like to Share Art with one of my blog readers! I just reached 300 followers and haven’t had a GIVEAWAY for awhile, so this seems like a great time! I’m going to giveaway an ONLINE WORKSHOP! Your choice of the three I have open right now, VISUAL JOURNALISM 101, SHADES OF GREY, or PURSUING PORTRAITS. If you have already taken all three, please still sign up and I’ll give you a $40 gift certificate for my Etsy Print Shop! And just to keep things fun, if we reach 100 entrants, I’ll up the giveaway to include two winners!! I wish I can experience in your class. What a lovely and meaningful theme for 2010, "Sharing Art." I'd love the opportunity to take another workshop with you. I learned so much in the Visual Journalism class. My workshop and class budget this year has been slashed so it would be a treat to win! Thank you for this opportunity. well its a long list, but a class may be just what I need, taking one instead of teaching one for a change, if its not too late I'd like to play too! Oh I would love to win a class. I too am sharing art this year. I am involved in a traveling sketchbook with 8 other artists.Love your blog and how much you are willing to share. Just a quick note to say that you rock! I started reading the latest issue of Art Journaling last night and I read your article,which was so inspiring and better yet, it was so nice to see that you are so admired by your contemporaries…I cannot wait for your book! What an awesome opportunity both in sharing art to raise funds for Haiti and your generous give away. I am going over the check out the etsy shop! I've just stumbled across your blog! Your work is really beautiful and I'd love to take up my drawing again. I feel very inspired having viewed your work! Thank you! Sounds like fun! I'd love to win. Hi Pam! It's been awhile since I have created anything and I have soooo wanted to take one of your workshops. Might be just what my muse needs!! Thanks for the chance!! wow, that would be so fabulous! please enter me to win one of your workshops :)i adore your style and would love to learn from you. I would love to take your self-portrait class!! I am beginning my journey into art anew after many years and one of your classes would certainly inspire me. Thank you! Thank you, Pam for offering this. I light my candle for Haiti. They are powerful. Pam, what an amazing opportunity this would be. Well, better odds in winning from 1 in perhaps 200 than 1 in a million. I'll keep my fingers crossed and so impressed with all of your continued generosity! Wow, how can I pass up a chance to learn? I'm such a newbie to online and blogging, and a total art beginner. I found your site through Lori Vliegen (she's wonderful).I see that you're now force to offer two freebies, since you're over 100. Wahoo. Great ideas…. I'll follow-up and see if there is something I can do. What a wonderful giveaway! I love the idea of these online classes~great when you can't get away. hello miss pam. i've been a bit remiss in my blog hopping lately. it seems life has a mind of its own. i am looking forward to seeing what art direction you go in this year and where all your creating takes you. looking forward to your book coming out. i hope you are doing well with that. i'll be watching and cheering you on! It would really be cool to take a class from you! I am a huge admirer of your style! Thanks for offering this up! What an exciting idea! I keep seeing your work in magazines and online, and I keep thinking I need to try some of your techniques. What better way than a workshop! Now the only question is which one? Maybe I'll someday take all three! Pam,your heart is as beautiful as your art, you are an inspiration to us all in this time of tragedy in Haiti. OM Grace and Goodness! I'd love to take a class from you! You inspired my goals and achievements list for 2010 in my art journal. Please pick me! I'd love to take one of your classes – oh for more time in the day! An online class, yay! I haven't tried one yet, so this would be great. I'm really enjoying your blog. Hello! I have seen your art in the Somerset magazines and would looooove to learn fron you! Yes, Haiti is on my mind every day. What a delicious giveaway! Thanks so much for the chance to win one of your lovely classes! Oh, how fun….I would love to have a class by you. What a great idea for giving. Who wouldn't want to take one of your classes? I've had my eye on that shades of grey one for a while. I would love to take or win a workshop with you!! 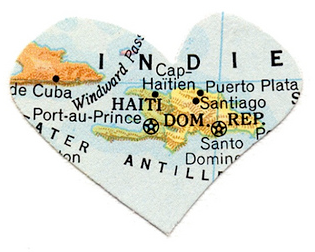 Hearts for Haiti is a great idea and I am off to check things out. I'll leave a note on my Facebook about it as well. Hi Pam! I have recently discovered your blog and art and I love your portraits sooo much! I am new in the mixed-media world but I'm enjoying it very much. I would love to take one of your classes.You are a very generous person, thank you. Pam you are such an inspiration! I have 'discovered' so many new techniques in following your blog. Thanks so much for sharing your gifts with us. I love your style and would absolutely LOVE to take a class with you! I would love to take one of your workshops – I really like your style; thanks for the generous offer! Learning from you would be a treat. Sign me up! And thanks for this generous opportunity! Oh, how I hope to win. I am in serious need of an artsy boost. Wow! A class giveaway is very generous of you! I'm already working on my art journal, but I would love to take another class.Thanks for the opportunity to enter your giveaway and for sharing the info about etsy's Hearts for Haiti. Love your work, have taken 2 of your workshops, but would love to win a third! Thank you Pam for thinking of a way to help those in Haiti. We should all help. I would love to take a class from you, especially in shades of gray! i can't think of anything better than sharing art 🙂 count me in. oooooh I'd be so thrilled to win a class from you! So nice of you to do this..keeping my fingers crossed that I win!! good luck everyone too..
Wow, great giveaway and wonderful project, I would love to have the chance to take another one of your workshops! How generous of you Pam….Thank you! Good luck everybody!p.s. and you're right, each portrait I attempt to do is special. I shall embrace the individuality of each one. Oh I'd love to take your portraits class!!! Put my name in the hat! !The Hearts for Haiti shop is awesome!! Thanks Pam! I'd love for you to include my name! And good for you – donating your work to the Haiti relief site. How generous of you to give everyone a chance at a free class. Your work is wonderful.i am going to check out heartsfor haiti. what a wonderful way to help. would love a chance to take one of your classes. You're too sweet! Hi Pam,This is my first visit to your webpage – wow, beautiful! I watched your ATC video on Somerset and found you this way. Will definately be back to check out new things. Happy New Year! Oh wow, I would love to win one of your art classes. I would pick Visual Journalism 101. Thanks for offering this wonderful giveaway and sharing your talents with the world. i just started art journaling. it's amazing how i feel since i started. thank you for sharing your art. Hi Pam thanks for such a generous giveaway. I would be thrilled to win an online workshop with you – my fingers & toes are crossed! thanks for sharing! i would love to take a class with you. It's a great cause you are sharing art for! I would love to take a class from you! Thanks for making this a possibility! Soooo excited. This would be wonderful to win. Thanks to you I picked up my paint brush and pencil after years and years of neglecting my creative spirit. So thank you. I'm currently taking your Shades of Grey course. Would love to take your other ones. God bless you for being proactive on behalf of Haiti. It's the small gestures we make individually that result in the giant miracles that are so needed.Thanks for getting us involved. Hi Pam what a lovely gift. I would love another class from you. Pam, your donation to the Hearts for Haiti is so very generous, and so is your giveaway, the opportunity to win one of your classes! I can only keep fingers crossed! What a wonderful giveaway Pam. I couldn't think of a better way to start the year than by taking one of your fabulous workshops! Gosh! How timely is this give away? I was just about to sign up for the Shades of Grey! I just made a order to DB for needed supplies, first. Now would be a perfect time to win seeing I have more classes coming up very very soon and squeezing out the funds is hard. I'd love to take a class with you but with money constraints I have a zero to no chance…unless the universe provides. My fingers are crossed!! !Thanks for being so generous to your blog readers. Great ideas for sharing.Lovely art you have created to help raise funds. Yes, Pam, anyone of these workshops would be wonderful! What a great giveaway! What a wonderful idea for arists to share with Hearts for Haiti!I would love to win a journalling course with you! Pam, I love your donated piece and your beautiful portraits in general. I would love a portrait workshop from you! And if I don't win one, I'll be watching when you offer one. Pam, what a wonderful idea to "Share Art" in the ways you've chosen. I'd love to take one of your classes. Thank you for your generous blog giveaway! Your Hearts for Haiti piece is awesome and perfect for the heart theme.Linda B.
Pam, what a wonderful offer. And your piece for Hati is gorgeous (as usual). I love your teaching style and your art, and that you share your art and all your talents! Thanks so much! Pam – I am so enjoying watching your journey with your book! Hearts for Haiti is a really good thing – it brings such good energy to helping others. I'm re-tweeting for you! Great to hear about the Hearts for Haiti site — will pass that info along. Wow — I would love a workshop with you. Great giveaway! Thanks for letting us know about the Hearts for Haiti site.I would love to win another workshop with you. I have done visual journalism 101, so my choice would also be portraits. Thanks for this great offer!!! Oooooh, totally fun and what a generous giveaway! !You are among THE most generous of artists and have a true giving spirit. What a wonderful opportunity! You are truly kind-hearted…I am touched by the Hearts for Haiti project and all of those talented individuals who are contributing their time and love. What a generous spirit you have! You seem like you are having such a good time living your life. Thanks for the opportunity to win one of your workshops. Hi Pam – I would thoroughly enjoy taking one of your classes! I think any of those that you listed would be really inspiring… so it would be hard to choose! Thanks so much for sharing. I would love to be put in the drawing for your class. I will pass the word! Oh, Pam!! I have never taken an online workshop before! I would love the opportunity to do so! I am a stay-at-home-mom to four wonderful kids and could sure use a little "art escape"! I live in the Midwest and fell on the ice two days ago, injuring my ankle pretty bad. I'm going to be homebound for a while, so this is just what I need!! Thank you sooooooooo much for offering this! I will certainly spread the word and share the (art) love! THANK YOU!!! That's wonderful Pam and so lovely of you to do a giveaway. I've just become a follower as I was trawling through my old issues of Somerset Studio/Gallery and they're my favourite magasines-difficult to get hold of here in the UK now our local branch of Borders has closed down.I saw some of your work in there and just love your style so a class would be fabulous.I'll be having a look at the Hearts for Haiti to see what I can do to help too.Thank you so much for this chance. I would love to take your Visual Journalism workshop. I enjoy your style of journaling. Thanks! Pam I love your art and one of your classes would be such a thrill to take. Thank you for sharing your talent and can't wait for your book! Best to you in the New Year! Wonderful idea Pam, I always said to learn, you have to teach. Thanks for sharing and caring. Hi Pam! I loved your Visual Journalism class. I refer to it all the time when working in my art journal. I think it's awesome that you are offering a class as a giveaway. I would love to take another class from you! Oh my goodness! A workshop with you? I'm overjoyed at the chance, please add me.Thank you! Pam! That's wonderful! I am so inspired by the Hearts for Haiti project. Good job! I would love to take one of your classes! I am just getting started in my art journey and am taking my very first workshop with Suzi Blu and have learned SO much in the last two weeks. It's amazing. I am looking for every learning opportunity that I can find, so to take one of your classes would be an invaluable experience for me. thank you for sharing your art with us!!! I would love to take another class from you!!! Ummm I am thinking portraits, yep, definitely portraits!! And my donated piece is up and posted on HeartsforHaiti. Thanks for sharing! !